Music has always been filled with mnemonic devices – remember memorising Every Good Boy Deserves Football for the notes on the five lines of the musical stave (EGBDF)? So why My Dog Has Fleas? MDHF do not correspond to notes! The four strings of the Ukulele are actually tuned to GCEA. Maybe it’s one of those questions where we simply don’t know the real reason. Maybe it’s because the Hawaiian word ‘Ukulele’ means Jumping Flea…? Note that the lower case ‘g’ is no typo – it represents the re-entrant, bottom string of the uke. ‘Re-entrant’ meaning the lower string is tuned one octave higher than your ears would expect. The ukulele has this feature in common with the G Banjo which has a high G string as its bottom string with its own characteristic tuning peg sticking out halfway up the neck. 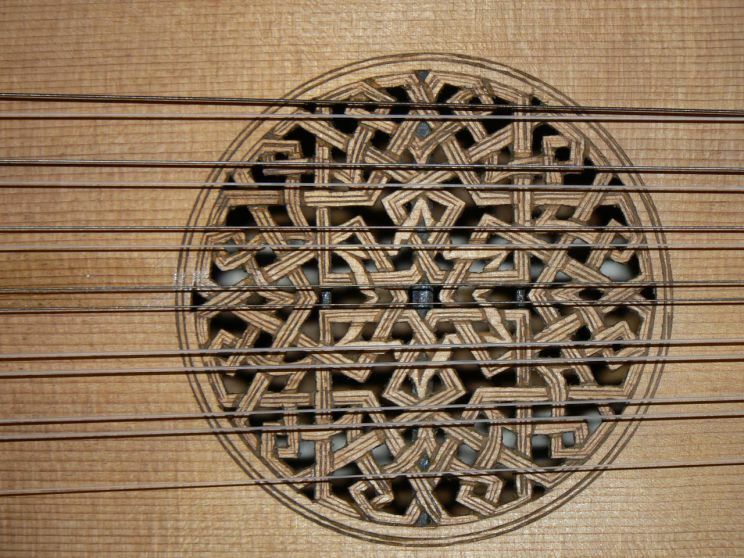 The baroque guitar would also commonly have not one but two re-entrant, “bottom” strings which could be written in shorthand as adGBE. 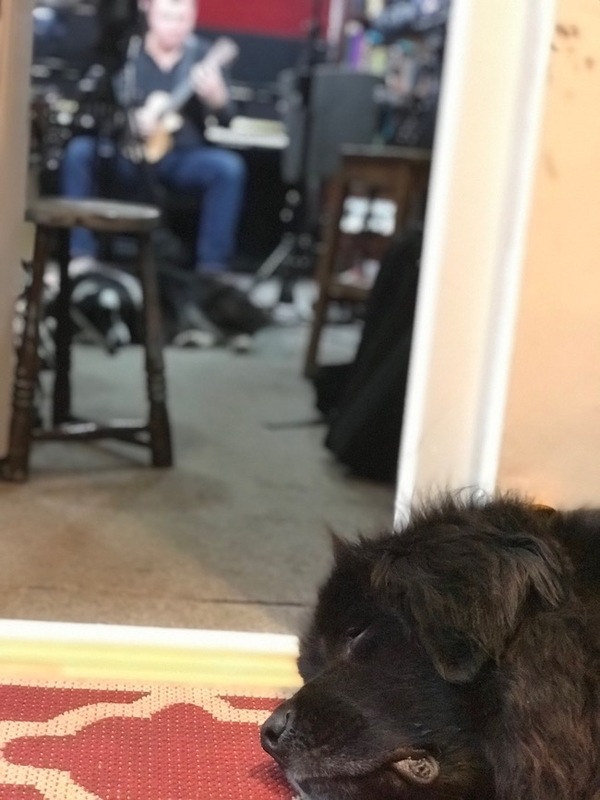 Richard is very fond of reminding people to tune their ukes in My Dog Has Fleas tuning. 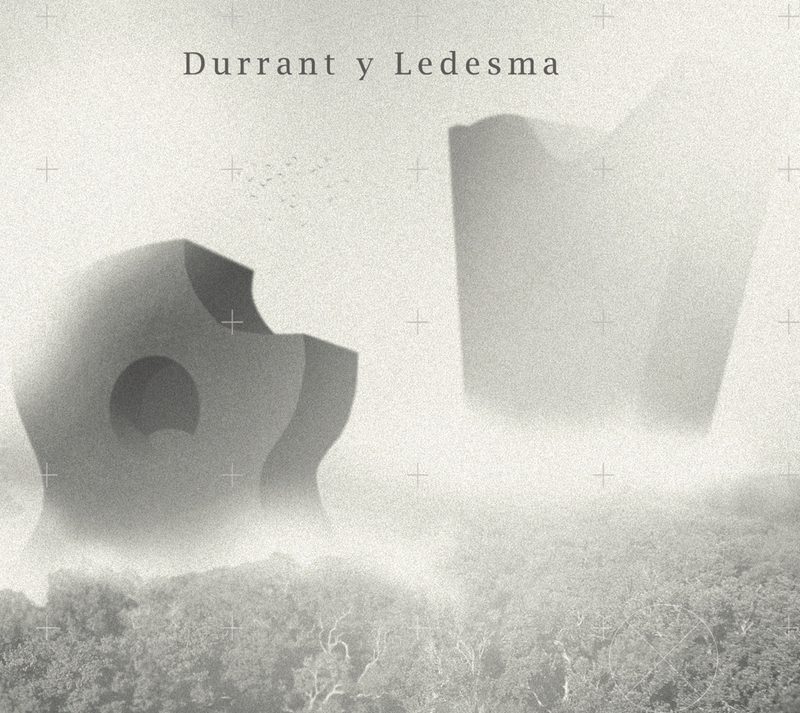 It’s even the title of a short film which can be seen on Amazon Prime: Richard Durrant – My Dog Has Fleas. 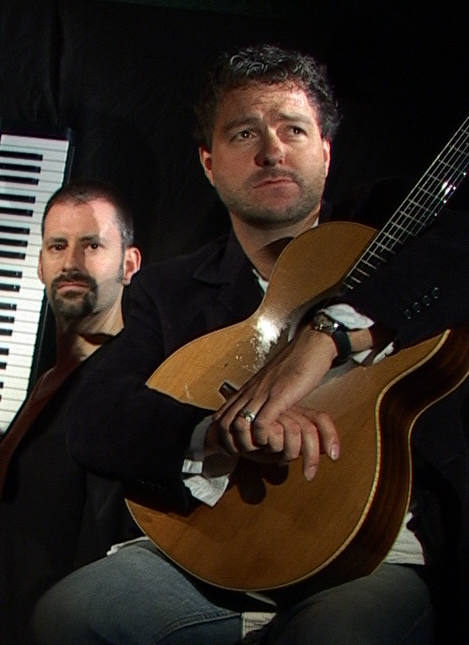 This was filmed last year by Peter Lisney during Richard’s orchestral project. 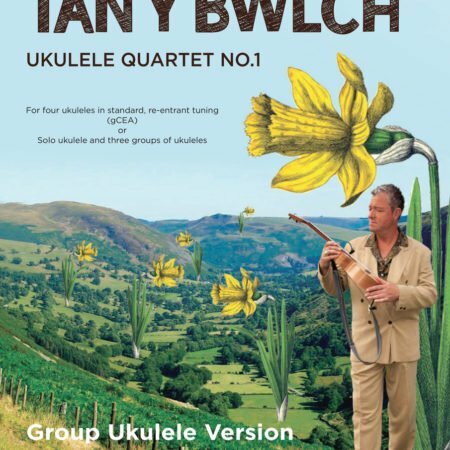 Richard celebrates the completion of his first ukulele quartet with a premiere performance at Ropetackle Arts Centre and the printing of a limited edition, souvenir score which can be ordered from the website. 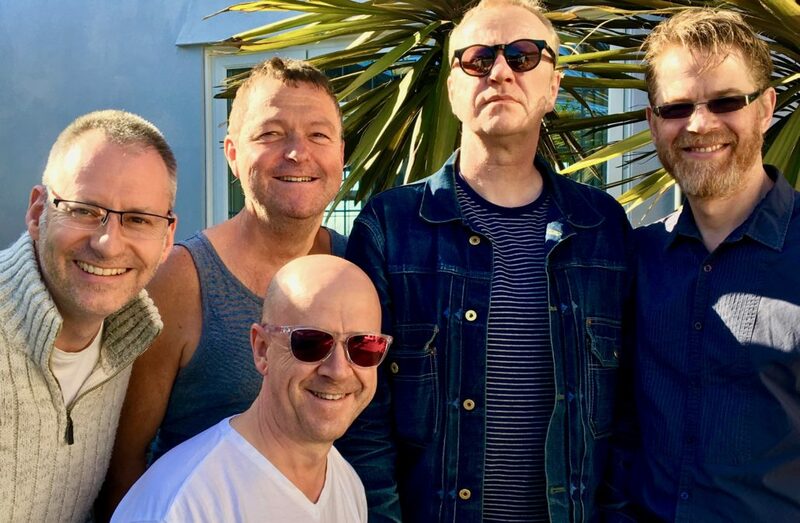 The premiere will be played by Richard with no less than thirty of his Ukulele Circuit Trainers who have been rehearsing three nights a week for the big day. 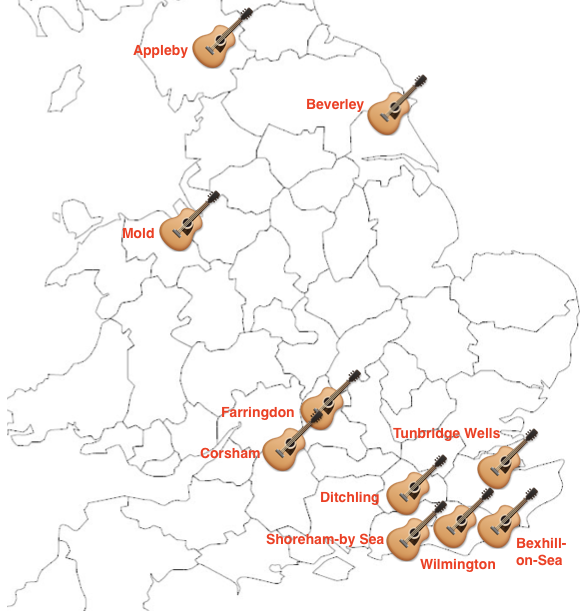 Richard’s ukulele year continues with performances at the Ukulele Festival of Scotland from 24-26 May before travelling to North Wales for the Meet The Ukulele Makers Festival from 31 May to 2 June. 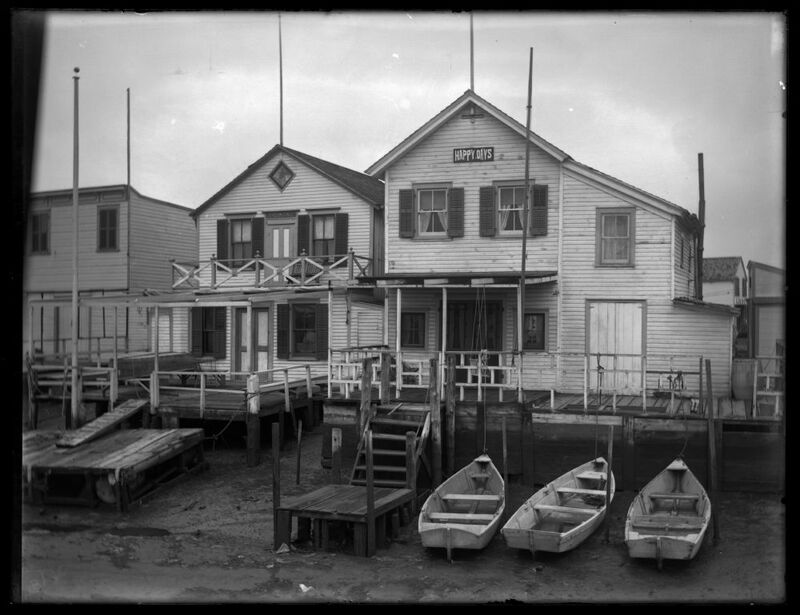 If you put Howard Beach into Wikipedia it brings up is an upper middle class neighbourhood in the New York borough of Queens! 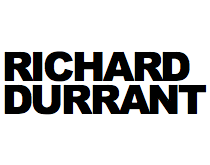 https://www.richarddurrant.com/wp-content/uploads/2017/07/RD-Crowd.jpg 2231 4813 Richard Durrant http://richarddurrant.com/wp-content/uploads/2016/06/rd1.png Richard Durrant2017-10-06 22:11:502018-05-09 21:34:01Where is Howard Beach? 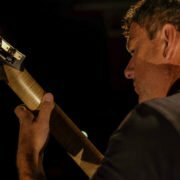 Some of the instruments Richard Durrant is taking with him on his current tour are made by two of the best Luthier’s currently working the UK. 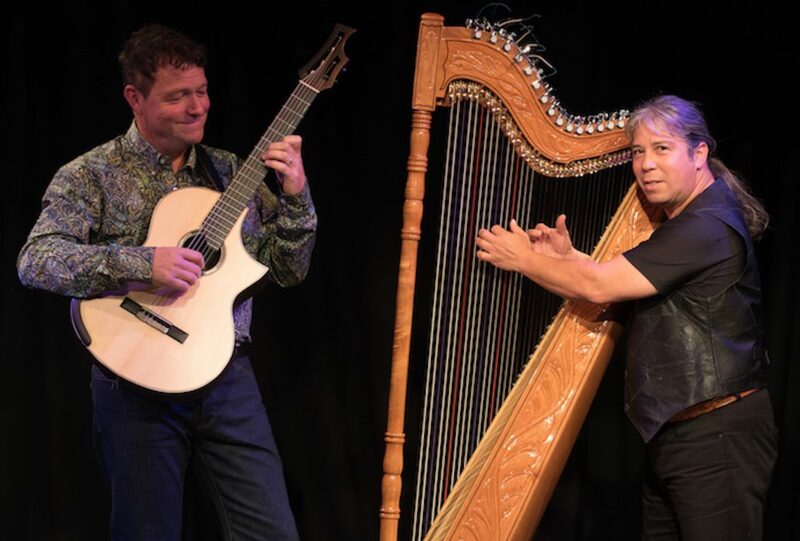 We find out more about their amazing instruments and their extraordinary work… British musician-guitarist and luthier Gary Southwell is based in Hough-on-the-Hill in Lincolnshire. 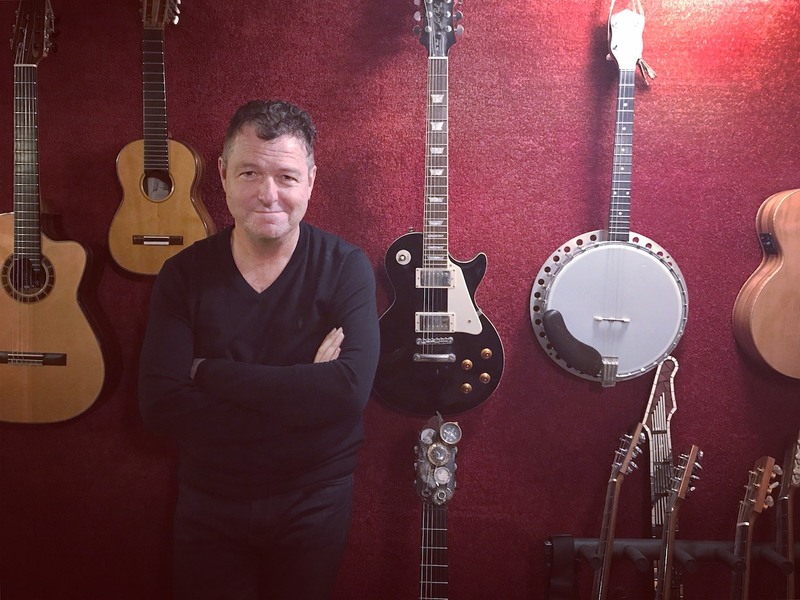 The the early part of Gary’s career focused on historical guitars, especially those of the early 19th century, a formative period for the modern day guitar. 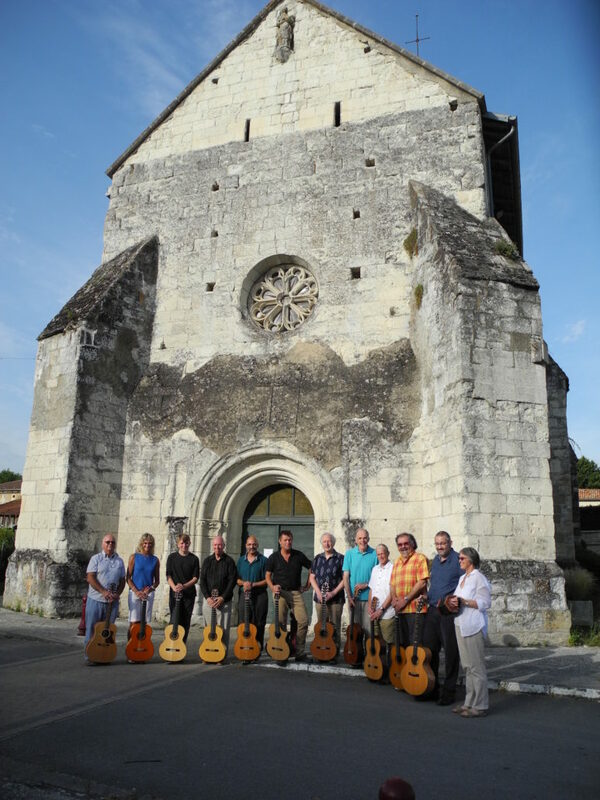 He researched instruments, worked in many collections throughout Europe, Russia and America, did restoration work and made many copies of significant historical guitars. 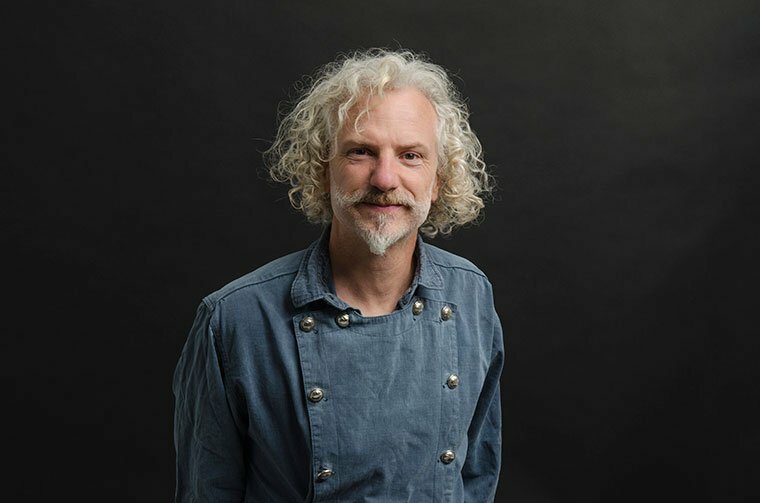 Gary Southwell started Southwell Guitars in 1983 and has since gone on to make guitars for an impressive list of distinguished musicians including Julian Bream, Sting and Paul Simon. 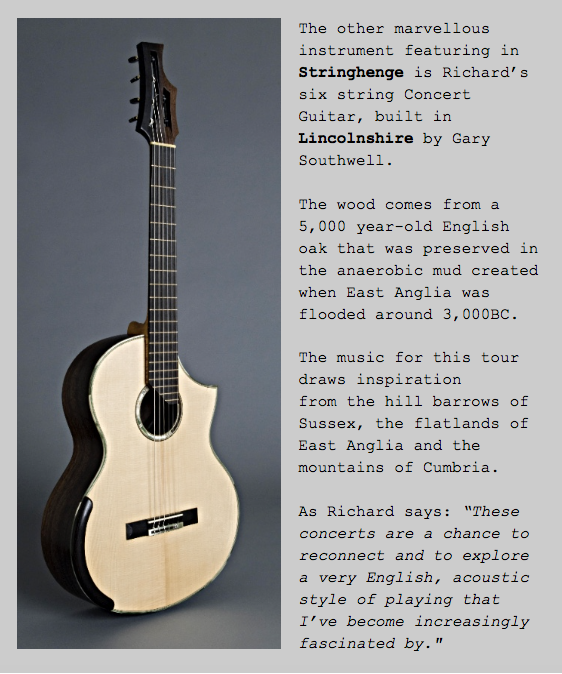 Richard Durrant plays a guitar created using Fenland black oak (also known as bog oak). 5,000 years ago a rise in sea level flooded the East Anglian Fenland basin which was then densely forested by gigantic oak trees. These spectacular trees eventually fell into the salty silt of what was once the forest floor where they have been preserved until today. 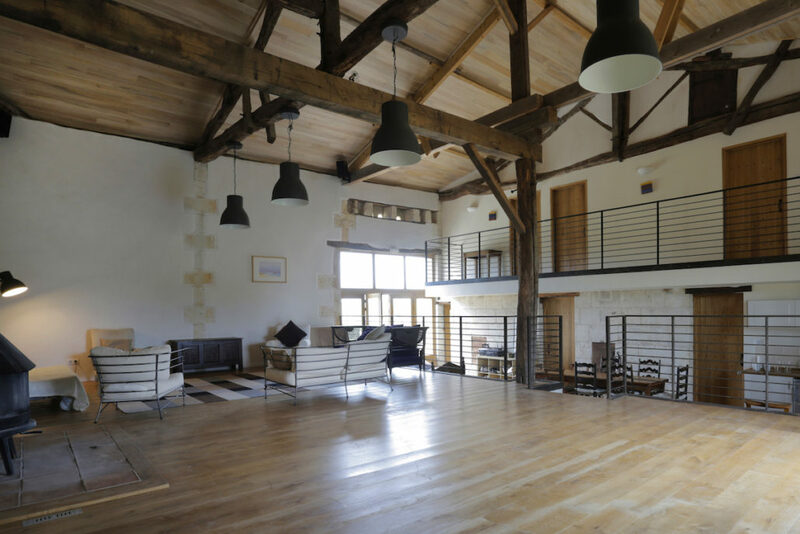 The dried timber is the rarest and most valuable of hardwoods with many unique and beautiful qualities. Not only does it look sensational, it has a density similar to rosewood and, most importantly to us, makes wonderful sounding guitars. 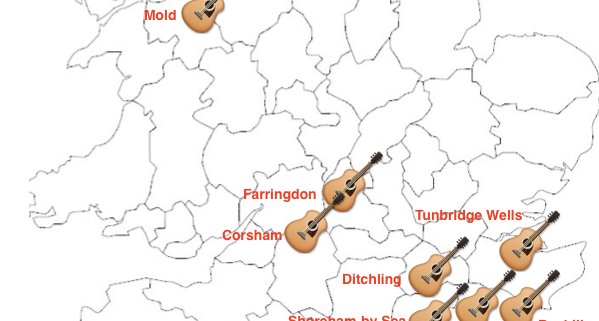 Sussex Maker, Ian Chisholm has been making guitars for over 40 years. 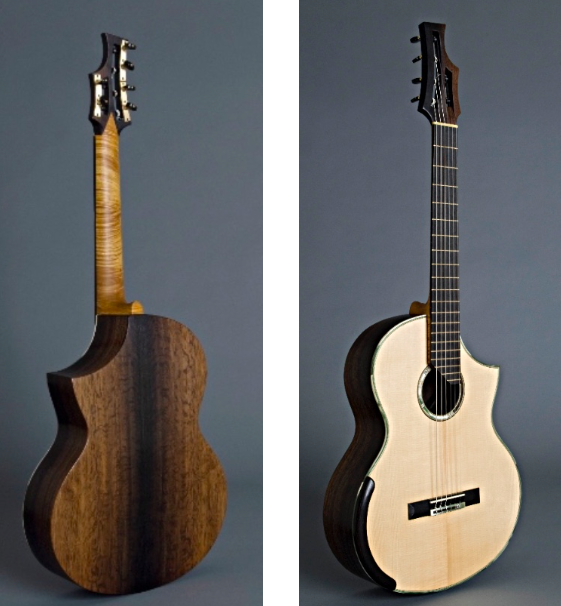 He started learning about lutherie – the art of stringed instrument making – in the 1970s when he took classes at the old College of Furniture taught by Tony Smith. 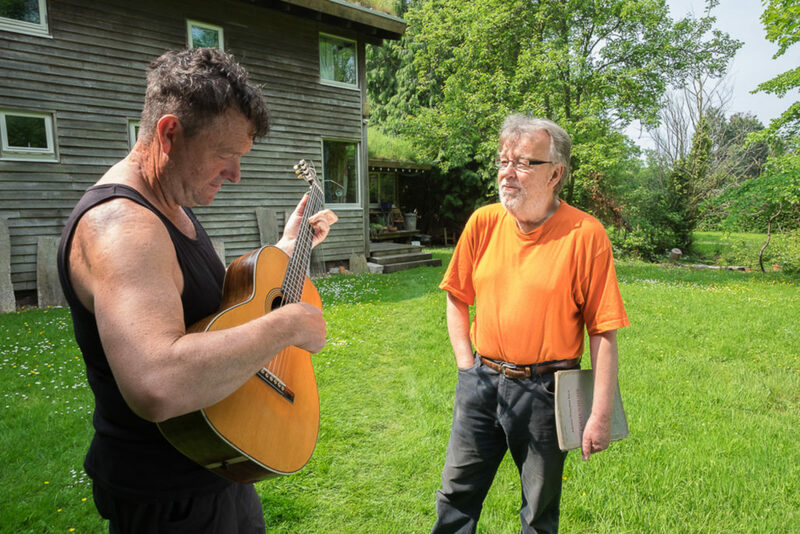 He built a lute at a Morley College class and when he moved to Ditchling in Sussex he built his first classical guitar and soon built an archtop mandolin. As he says: ‘learning never stops’. 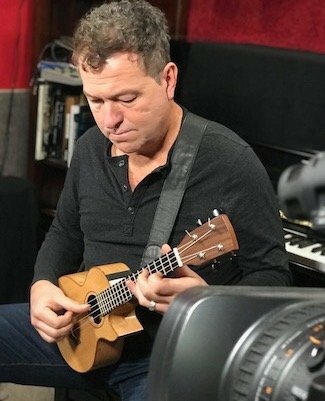 Ian has just completed his first ukulele which Richard will be playing at the Premiere of Six Groves For The Ukulele on 10 September at Ropetackle Arts Centre. 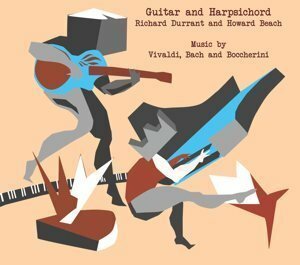 Richard Durrant also plays two of Ian’s instruments; a celtic bouzouki – which he refers to as a long neck mandola, and the now almost legendary tenor guitar featuring a beautiful silver inlay of the ancient horse carved into the chalk at Uffington. 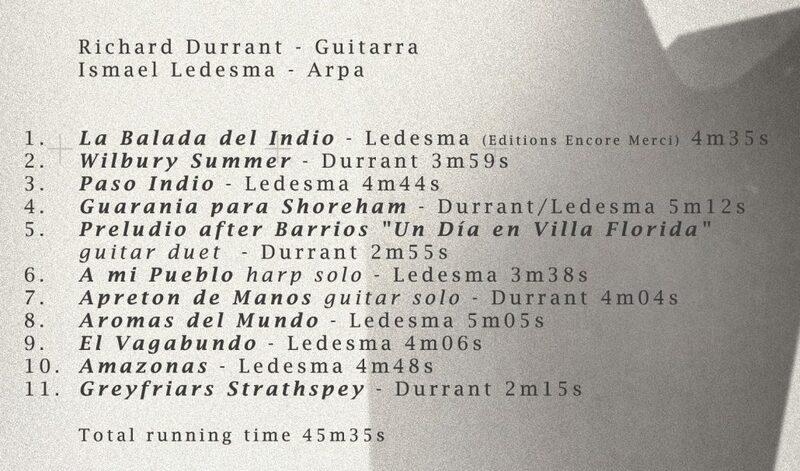 Hear these amazing instruments played by Richard Durrant in a concert near you. I arrived back home with a brand new Gary Southwell “bog oak” guitar in July 2016, but I didn’t play it properly until late August. Of course I’d played it already, it was my concert guitar of choice, but during those first weeks I couldn’t bring myself to pick it up. I kept walking up to the closed, guitar case, circling it and walking away again. The problem was the tree that the back and sides of this incredible instrument were made from – an English oak tree that grew over 5,000 years ago. It had fallen to the ground when the flatlands of East Anglia were flooded by sea water and had been preserved in anaerobic mud. For me that tree represented something so ancient and spiritual, and gave such a direct link to the past that I didn’t know how to connect with the guitar it had become part of. Any concert artist’s relationship with an instrument is about as deep as it gets but with this guitar I didn’t know where to start, what to play on it or how to begin our relationship. So there I was unable to touch the most beautiful guitar I had ever seen, unable to get the damned thing out of its box and with no artistic reference nor reason to play it. What I did have were vague thoughts about shapes in the landscape providing archeological clues and inspiration – but even the ancient burial mounds I’d walked past on the south downs weren’t old enough to provide a link. Then I began to think about those strange figures on the chalk downlands, the mystical hill carvings of southern England, and I began to see a way forward. As a kid I was fascinated by the Long Man of Wilmington, a giant human figure carved onto the side of the downs near Eastbourne. There he stood holding two white sticks and looking as if he was about to walk away. We sometimes saw the giant from my Dad’s car on Sunday drives, we even climbed up Windover Hill to see him. Then, from 1992 to 1995, I found myself living in Wilmington Priory, an 11th century tumbledown building lying at the feet of the Long Man himself. During those few years spent in such close proximity I began to think of him differently. Although the giant’s credentials were somewhat shaky (he was most likely just an 18th century folly) I felt a growing connection and began to see that the he wasn’t holding two sticks, instead he was holding open a doorway. He appeared, to me, to be beckoning, inviting me to step through to the other side. I enjoyed this moment of realisation and played with the idea each time I climbed Windover Hill alongside the Long Man. As I have always believed that music also holds open a door to the other side, so I adopted the LongMan as the name and logo of my fledgling, acoustic, record label and began to follow the giant’s gesture of invitation as part of my daily work playing concerts. That was many years ago and LongMan records has since been and gone. I now live on Shoreham Beach, still in sight of the Sussex Downs, and have raised my family next to the sea – but fast forward to the dilemma of the bog oak guitar to witness another moment of realisation courtesy of the Wilmington giant. One day whilst plucking up courage to play the bog oak guitar I began thinking about the Long Man’s invitation to step through and decided to accept. I opened the case, picked up the guitar, stepped through and began to play. I played Bach and I didn’t stop. 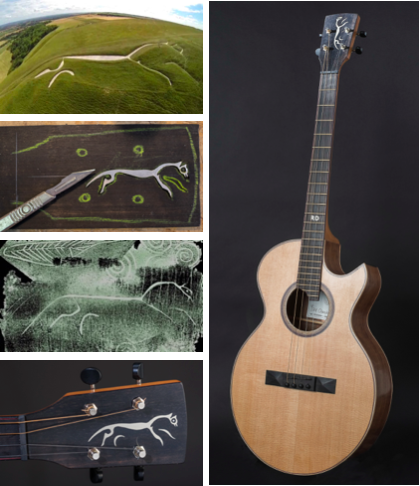 In fact I played nothing but Bach on that guitar for a solid month whilst thinking about the ancient tree, the British landscape, the shapes up on the downs and the ancient hill carvings. I focussed particularly on the white horse at Uffington, the most mysterious of all British works of art, at least 2,000 years old and impossible to see properly except from the air or whilst playing Bach. 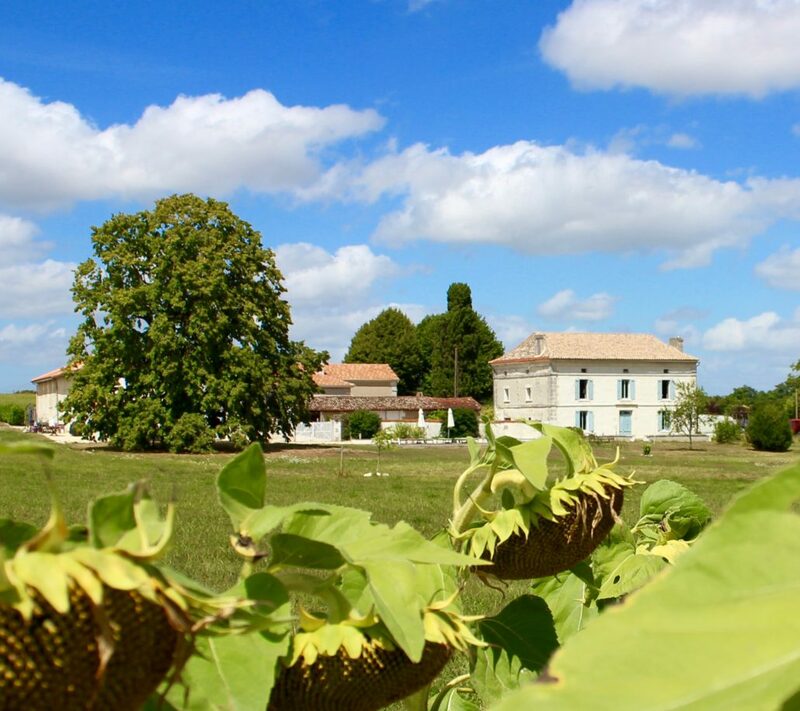 At times I felt that I was using Bach to unlock the landscape, hill barrows and all, and to connect myself to my very roots. After some weeks I began to augment the solo Bach with British folk melodies. To my ears this was a natural progression and I felt I’d hit upon a sonically profound juxtaposition. I then began to organise these sounds into an imaginary concert and Stringhenge began to take shape. 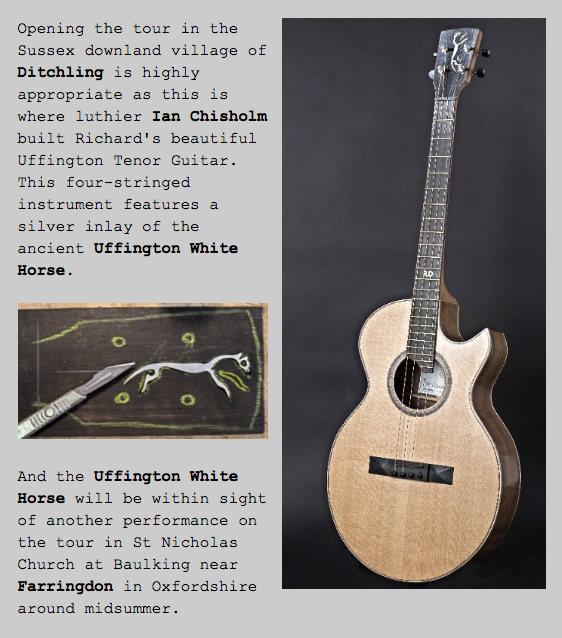 I had also commissioned a tenor guitar, from the wonderful Sussex luthier Ian Chisholm, with a silver carving of the Uffington white horse. 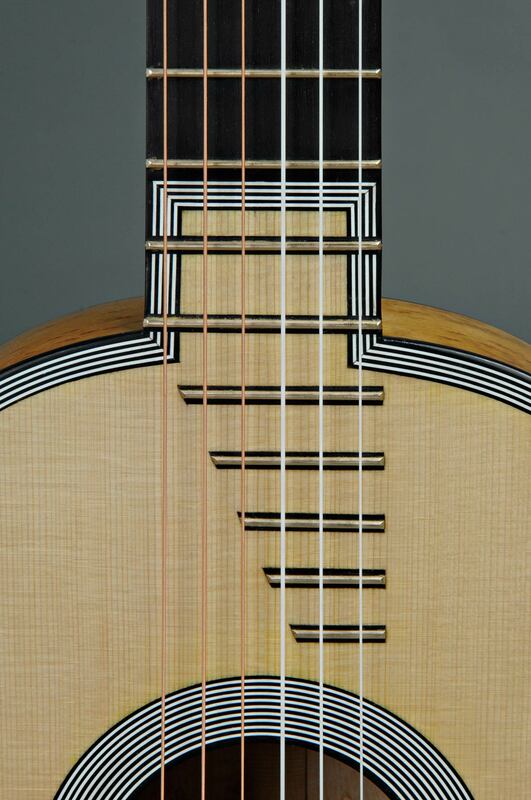 This second guitar (christened the Uffington Tenor and tuned like a member of the violin family), would allow me to play Bach’s solo suites without changing a single note. 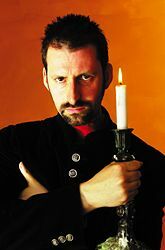 Likewise the British Isles folk melodies would lye more naturally under the fingers on an instrument tuned in fifths. 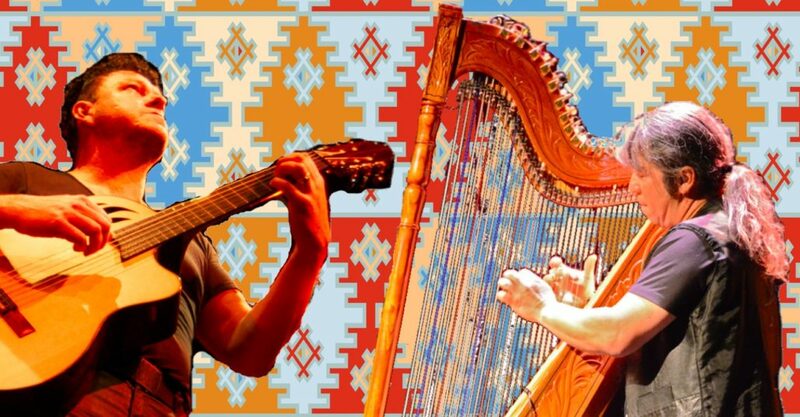 With the Southwell concert guitar and the Uffington Tenor I was now free to complete my Stringhenge show and I began gathering artwork and ideas to create the right feel for building my onstage henge. 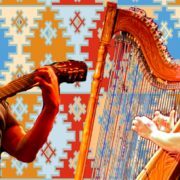 I would write additional pieces for both guitars, starting with Metanoia my tribute to the late John Renbourn (and an adventure in English Folk Baroque), and also gather tunes, both traditional and by other British composers. 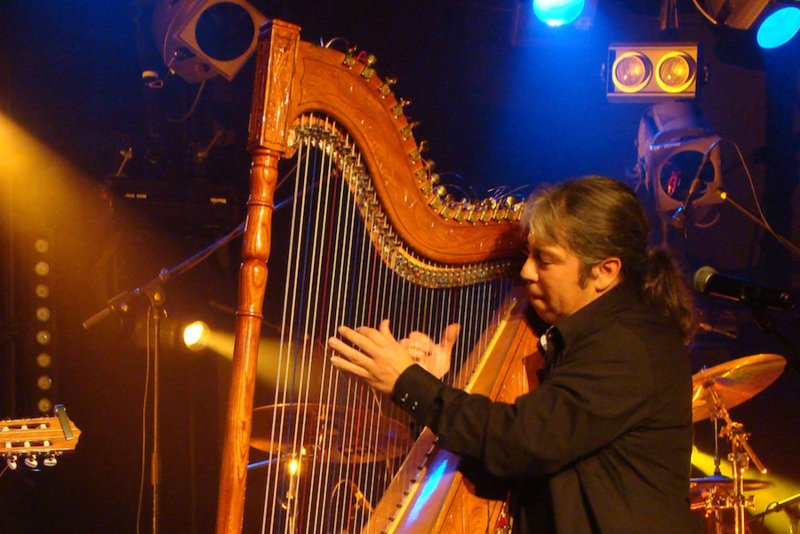 At the time of writing I have played several Stringhenge concerts and plan to continue the tour; the idea still fascinates me. This fascination is centred around my deep love for the British Isles, and with Stringhenge, I have found a context that makes it comfortable for me to express this. The context is crucial, and I have met and spoken with people at the performances who express similar views. I have no sense of patriotism in the normal sense of the word, I certainly have no interest in the royal family, no time for flag waving (beyond the occasional Morris dance) and I feel a deep sense of shame and loss as we separate ourselves from our European brothers and sisters. There is a lot not to like about being associated with Britain at this time in our history and it has been proved time and again that patriotism can be a very ugly word. Now, somehow, a 5,000 year old tree from East Anglia has played a part in granting me permission to express a love for my country that feels both easy and natural. 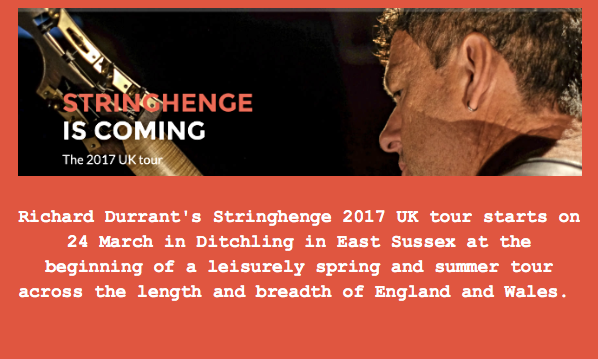 I sincerely hope that my audiences can share in this as it would be an extremely positive outcome for Stringhenge and my two, very special guitars.